Sleeps 2, 1 bedroom cottage. Knoll View has a spacious open plan living room with exposed beams and a vaulted ceiling. All Solid oak furniture in lounge and bedroom tiled floors with wonderful underfloor heating throughout. Electric wood effect wood burner in a stone surround fire place. Good sized double bedroom , memory foam mattress for extra comfort with a modern contemporary en- suite, toiletries and 100% Egyptian cotton towels. Set within five acres. Peaceful location an ideal choice for a great escape. Lovely cream tea on arrival! Shower, wash basin and WC, underfloor heating. One free pass available per person per stay to use facilities at the local Webbington Spa which has a swimming pool, sauna, steam room and fully equipped gymnasium. 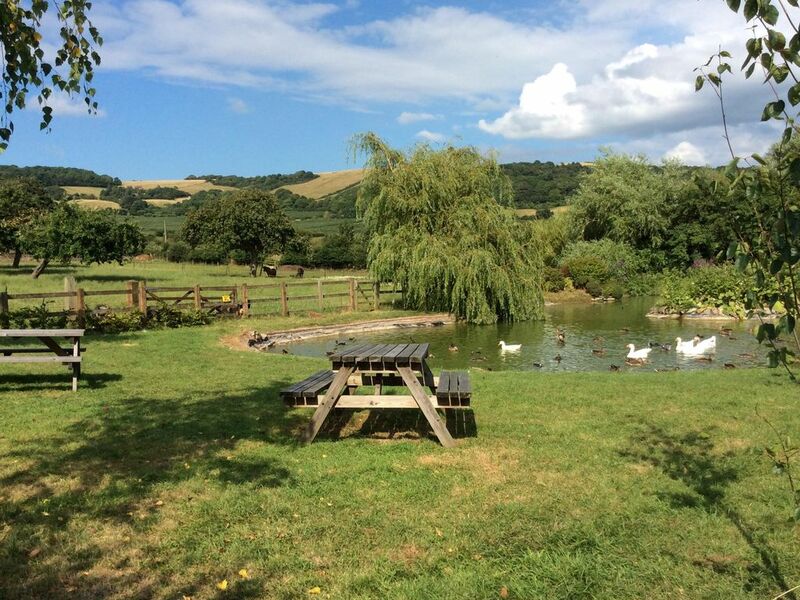 We couldn’t have found a better place, Knoll View is a gem in North Somerset. Trudy and Paul made us feel very welcome, as did Archie and Frank. They had great tips about the area and helped us make the most of our way too short trip, just three nights. Great location tucked away, but with easy access to sights and activities. We enjoyed the local pubs as well as a couple day trips including the beaches in Weston-Super-Mare and Burnham-on-Sea. We visited nearby Cheddar after a “Full English” in Glastonbury. It was great to know we had a comfortable, cozy, well kept cottage to return to. The area is beautiful and the property is stunning! Thank you Trudy and Paul, hope to be back soon! We spent a very enjoyable and comfortable 11 nights in the beautiful Somerset countryside. The welcoming afternoon tea was enjoyed by all and the cottage was absolutely delightful and ideal for the two of us. The furniture and bed was extremely comfortable. The cottage was well appointed and pleasingly decorated. Trudie was extremely welcoming and very helpful. We loved our stay in Knoll View cottage and hopefully will stay again. The property was just right for the two of us, with good sized rooms that were light and airy; very well maintained and spotlessly clean. The underfloor heating was perfect for my cold feet! Perfectly positioned in quiet countryside, but within easy reach of Weston-super-Mare, Cheddar, Wells, Bristol and Bath. The owners were away, but their son checked that all was ok. The property was fine, and very well equipped. It was nice and clean and so quiet ! We made the best of the weather which was tedious, but the cottage was fine! We enjoyed the area and Somerset was lovely too. There's plenty to do in that vicinity and plenty to see. We know Western super mare well and feel at home there. Trudy most welcoming host - scone cream tea on arrival superb.